Thanks to Drs. 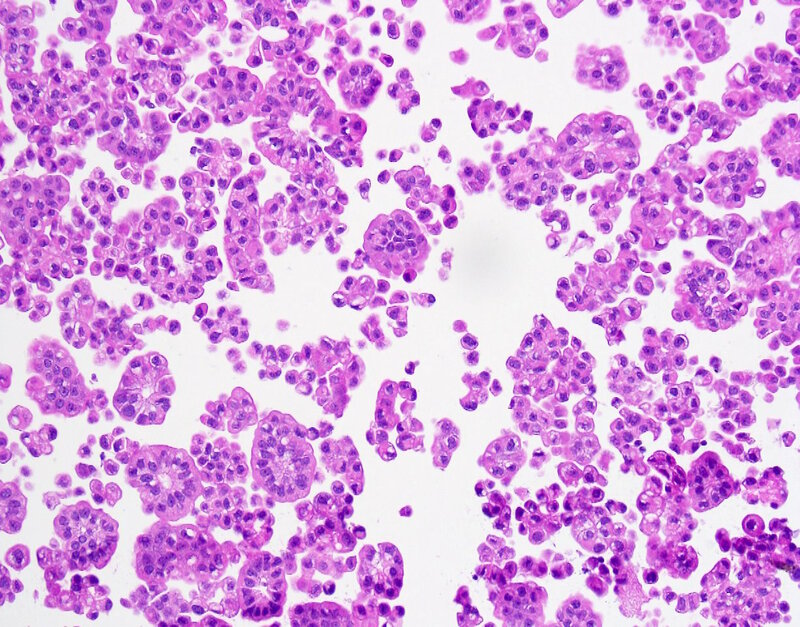 Vanya Jaitly and Songlin Zhang, University of Texas (USA) for contributing this case, Dr. Nat Pernick, PathologyOutlines.com, for writing the discussion and Drs. Debra Zynger and Maria Tretiakova for reviewing it. To contribute a Case of the Week, first make sure that we are currently accepting cases, then follow the guidelines on our main Case of the Week page. MEMPHIS, TENNESSEE (USA). The Department of Pathology and Laboratory Medicine at St. Jude Children's Research Hospital is seeking a faculty hematopathologist at the level of Assistant, Associate, or Full Member (equivalent to the rank of Professor at other academic institutions). This recruitment is to a replacement position in a growing department and is taking place at an exciting time in the development of clinical laboratory services and the institution. The successful candidate will have skills in histopathology, cytology, flow cytometry, and molecular pathology, must have a record of scholarly achievements, be board-certified in AP or AP/CP, and be board-certified or eligible for board certification in Hematology. The position is allocated to the Clinician Track, on which 75% effort is devoted to patient care activities. The appointee will be affiliated to the Hematologic Malignancies Program at St. Jude, within which there will be opportunities for collaborative clinical research. 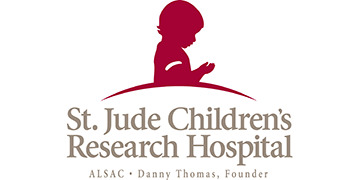 St. Jude Children's Research Hospital is one of the premier pediatric cancer hospitals in the USA and has a strong faculty of clinical and basic investigators organized into traditional academic departments. Strong interdepartmental programs are present in pediatric solid tumors, hematological malignancies, neuro-oncology / development neurobiology, molecular oncogenesis, and immunology. Clinical and basic research activities are carried out in adjacent state-of-the-art buildings on the St. Jude campus, which provides an environment to foster close collaboration between clinical and basic science investigators. St. Jude is an equal opportunity employer and a drug-free work place. Candidates receiving offers of employment will be subject to be pre-employment drug testing and background checks. (1) Our Fellowships page now lists advertised Fellowships by organization, as well as by date posted, location, year open, and subspecialty. It helps organizations / institutions keep track of all of their ads. This option is available for institutions that purchase a promotional package of 6 or more fellowship ads. Contact JoyPathOut@gmail.com for more information. (2) Our What's New In Pathology email newsletter has surpassed 10,000 subscribers. To get this informative newsletter, sign up here. You can also view past newsletters on this page. (3) Make sure to get our emails! A 79 year old man presented with shortness of breath. 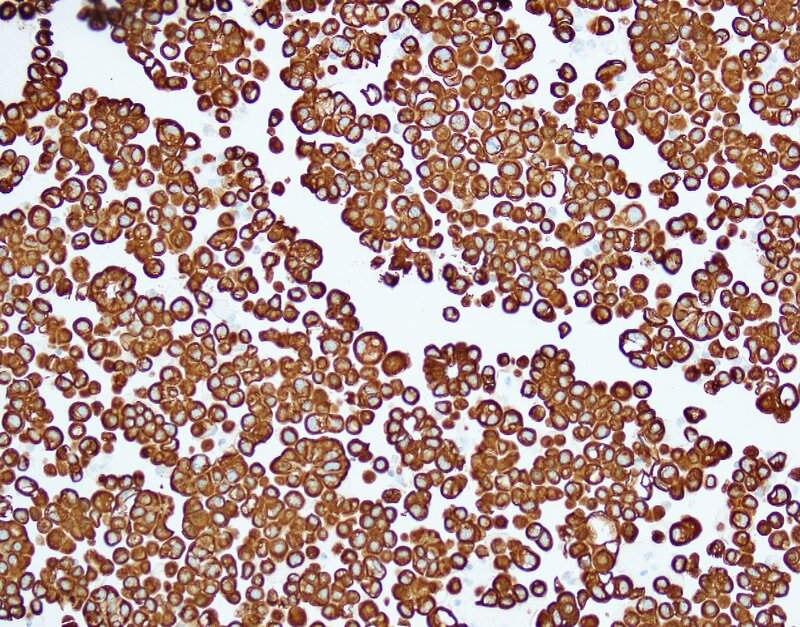 After workup, an image guided diagnostic thoracocentesis was performed, which yielded 1.5 liters of serosanguinous fluid, which was sent for cytology. What is your diagnosis (differential diagnosis)? Which of the following is true about micropapillary carcinoma of the bladder? A. 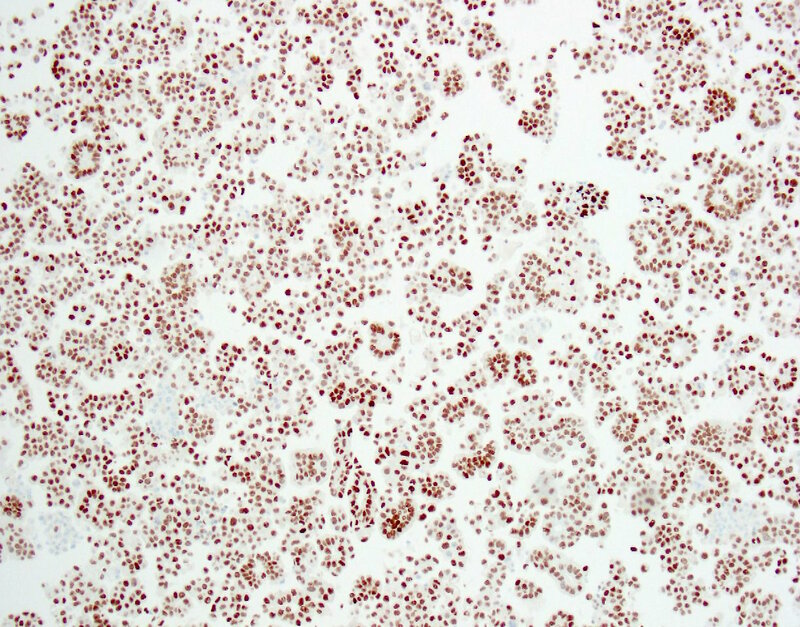 A panel of immunostains is typically necessary to determine the site of an unknown primary. B. The micropapillary component only needs to be reported if 50% or more. C. Treatment response is comparable to other urothelial carcinoma. D. Tumor cells appear in small clusters with a vascular axis. The patient had a past medical history of renal cell cancer (no pathology report available), bladder carcinoma in situ (by biopsy, no invasion identified) and prostate adenocarcinoma. The bladder CIS was treated with transurethral resection of bladder tumor followed by BCG maintenance therapy. The outside pathology slides were not available for review but the report did not mention micropapillary features. 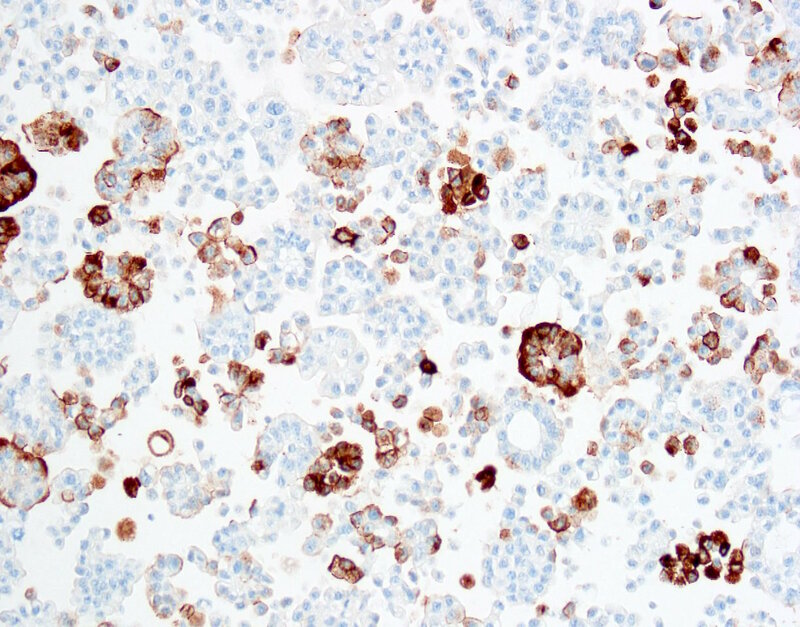 The tumor cells were positive for CK7, CK20, CA125, GATA3, MUC1, HER2 and p53, and negative for CK5/6, TTF1, p63, napsinA, D2-40, calretinin, WT1, CDX2, ER, PR and mammaglobin. 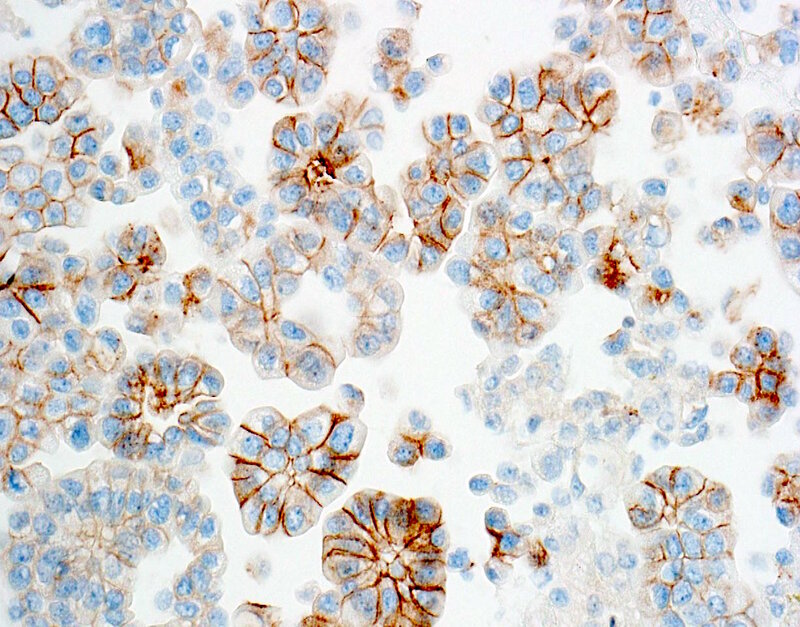 These IHC results were consistent with a urothelial primary. Although the contributors believed the primary was most likely from bladder (and the discussion focuses on this), since there was a history of invasive renal cell carcinoma but no history of invasive bladder cancer, our reviewers think a renal pelvic micropapillary urothelial carcinoma is also a consideration. Both have similar IHC findings. 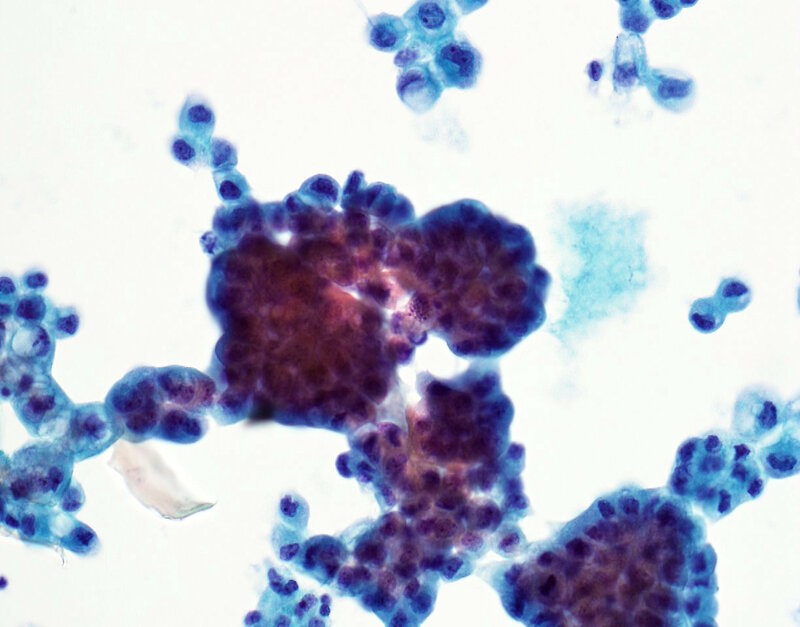 The micropapillary variant of urothelial carcinoma was first described by Amin et. al. in 1994 as a rare variant of of urothelial carcinoma resembling ovarian serous papillary carcinoma (Am J Surg Pathol 1994;18:1224). Histology shows small tight clusters of tumor cells floating in clear spaces and slender, delicate filiform processes. In contrast to conventional papillary carcinoma, no vascular axis is present. When this morphology is extensive, lymphovascular invasion is usually present (Mod Pathol 2015;28:612). Features associated to diagnose this variant which have consensus among experts include multiple nests in the same lacuna, intracytoplasmic vacuoles and epithelial ring forms (Am J Surg Pathol 2010 ;34:1367). In a recent study of 869 patients from the US National Cancer database, the median age was 69.9 years, and most patients presented with high grade (89.3%) and muscle invasive or locally advanced disease (47.6%) (Bladder Cancer 2016;2:415). Most cases show a mixture of growth patterns. Amplification of ERBB2 and overexpression of HER2 are common (Hum Pathol 2018;77:63). 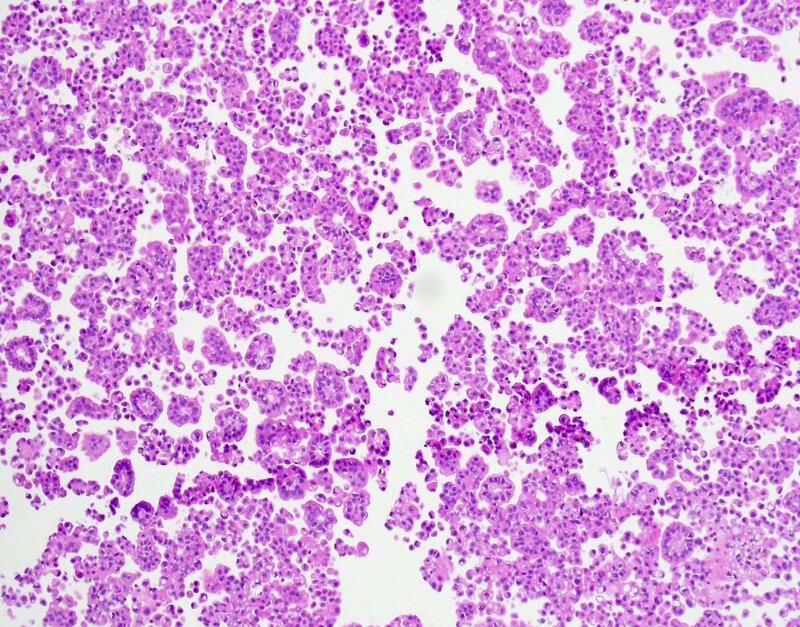 There is no standardized percentage of micropapillary histology required for this diagnosis, with reported criteria ranging from focal to almost 100%. As a result, the International Consultations on Urological Diseases recommends reporting this variant morphology with an estimate of its proportion (Mod Pathol 2015;28:612). The differential diagnosis of micropapillary carcinoma at any site includes metastases, particularly from the breast, colon (Oncol Lett 2016;12:1154), lung, ovary, prostate (Arch Pathol Lab Med 2012;136:1447), renal pelvis, salivary gland (Am J Surg Pathol 2004;28:319) and stomach (World J Gastroenterol 2015;21:5548). Recommended panels to determine the primary site include uroplakin, CK20, TTF1, ER, mammaglobin and WT1 or PAX8 . 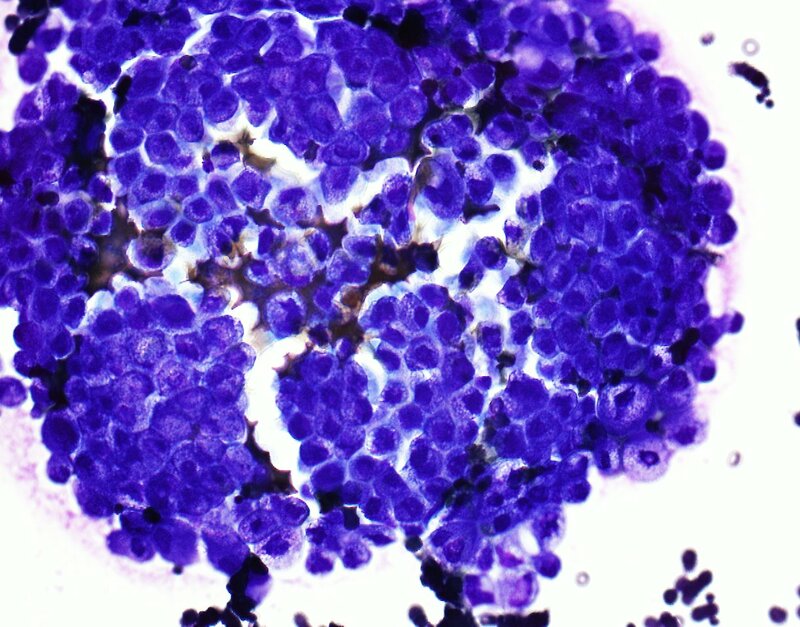 The most important markers by site are urothelium: uroplakin+, CK20+; lung: TTF1+; breast: ER+, mammaglobin+, PAX8/WT1- and ovary: PAX8/WT1+, ER+, mammaglobin- (Am J Surg Pathol 2009;33:1037, Adv Urol 2011;2011:217153). 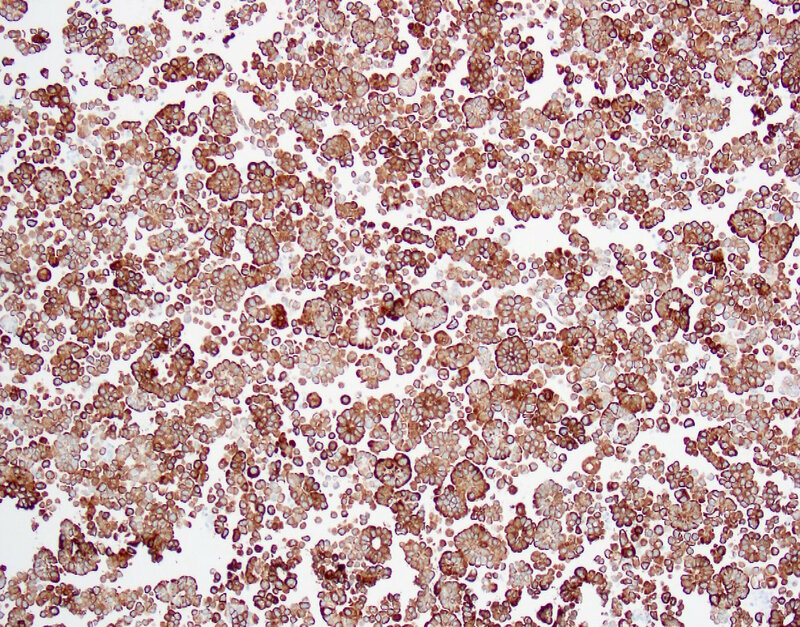 Our reviewers questioned the need for so many IHC stains in this male patient, particularly ER, PR, mammaglobin, CA125 and p53. The pathophysiology of micropapillary urothelial carcinoma is unknown. In response to chronic injury, cells may acquire somatic TERT promoter mutations, overcoming the telomere dependent proliferative barrier (Virchows Arch 2016;469:427). 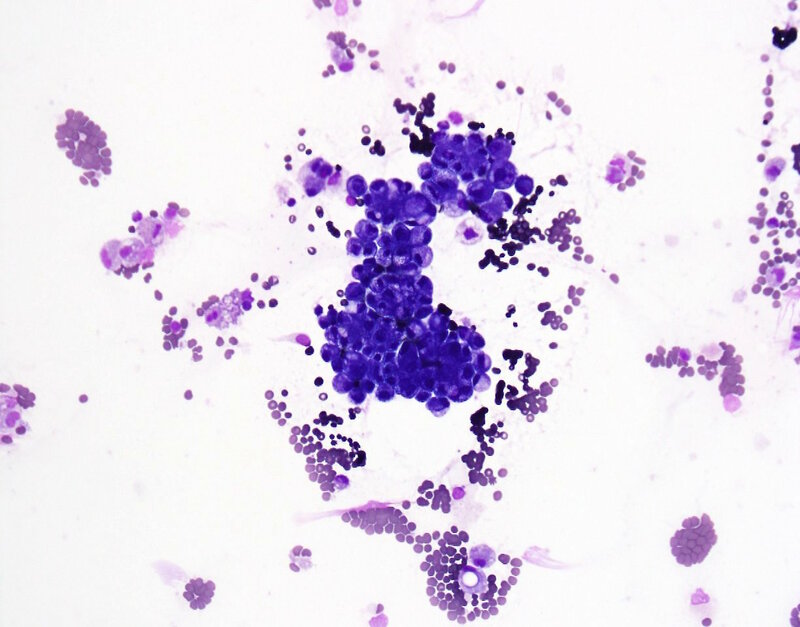 In the breast, micropapillary carcinoma exhibits polarity reversal in cell clusters, which increases the risk of invasion and metastasis. Polarity reversal can be identified by immunohistochemistry for E-cadherin, EMA, MUC1 and sialyl-Lewis X. The polarity reversal may be due to overexpression of β1 integrin and the resultant upregulation of Rac1 (Oncotarget 2017;9:4338). Prognosis is poor regardless of treatment modality (Bladder Cancer 2016;2:415), and there is no consensus regarding appropriate management (Mod Pathol 2015;28:612, Urol Oncol 2014;32:826). Any component of micropapillary histology, including surface noninvasive components, is considered to be significant; as the proportion of the micropapillary component increases, the prognosis worsens (Virchows Arch 2016;469:427). 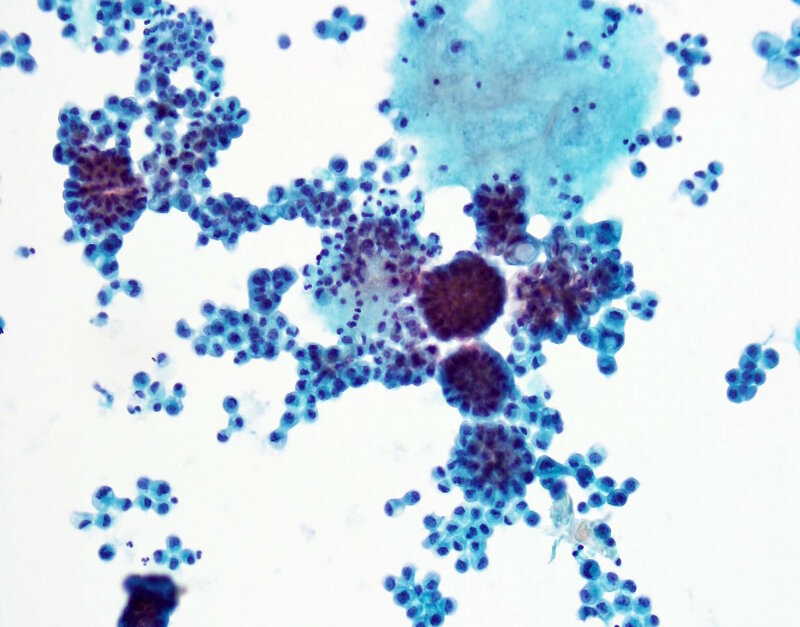 Poor prognostic factors include high grade cytology, angiolymphatic invasion and high stage at presentation, including frequent metastases (Am J Surg Pathol 1994;18:1224). Similar to like tumors in other organs, micropapillary bladder cancer appears to be less responsive to chemotherapy and intravesical BCG than more common tumors of the same organs (Virchows Arch 2016;469:427). The patient died a short time later.